Paint Protection Available At Precision Car Audio Call Today! 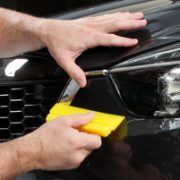 Paint protection film, or “clear bra” as it is sometimes known, is one of the best ways to preserve the showroom quality finish on your vehicle. The virtually invisible film will keep your vehicle looking newer longer- without changing the design features or color- by protecting vulnerable areas such as front bumpers, hoods, side mirrors, door handle cavities, door edges, rocker panels, and rear fender panels. Preserving the finish of your vehicle with paint protection film (PPF) keeps your vehicle looking newer longer, and can enhance the resale value of your vehicle in the future. Your vehicle is one of the biggest purchases you will make. Protect it. Keeping your vehicle looking new with a quality paint protection film from a company you can trust is important. 3M Paint Protection Film is the choice of NASCAR race teams and new car manufacturers all over the world for a reason.